Do you see white sauce here? I don't. A dish made of pieces of meat, especially chicken or veal cooked and served in a white sauce. 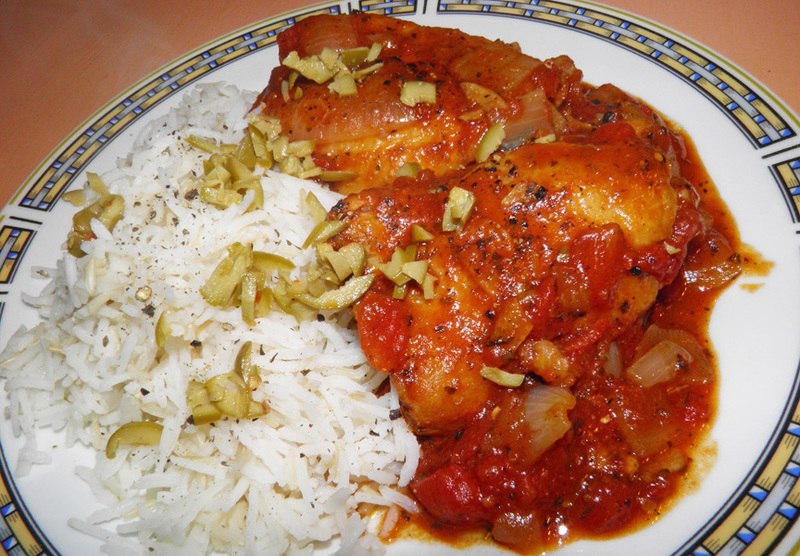 A catch-all term used to describe a stewed dish typically made with poultry, but other types of white meat can be substituted. It is cut into pieces and then stewed in gravy, which is then thickened with butter and cream or milk. It often includes other ingredients and vegetables. This recipe? Maybe. Hopefully... Let's just say "yes." I have been making this dish for decades. I was quite surprised to find out from none other than the venerable Cambridge Dictionary that fricassee had a white sauce. This is most definitely not white. I would say it’s actually rather red… deep red. Regardless, it is still a stewed (of a sort) dish that is served in a most delicious “gravy.” It’s been so long that I really can’t remember where I got this recipe, but I do know my source called it fricassee. Perhaps the original was finished with some cream, and I conveniently forgot that step. Who know what else has changed from the original now that one thinks. But does it really matter? The main thing about food is that it should be nutritious and delicious. I believe this one fulfills in both categories. 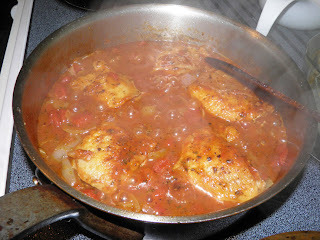 “Fricasseeing” (or whatever we want to call this) makes the chicken very tender and almost fall-off-the-bone. Tomatoes are exceedingly good for you, as is vermouth – in small quantities. Ha ha. Words to the wise: don’t "cheap out" on the tomatoes you purchase. Garbage in; garbage out. 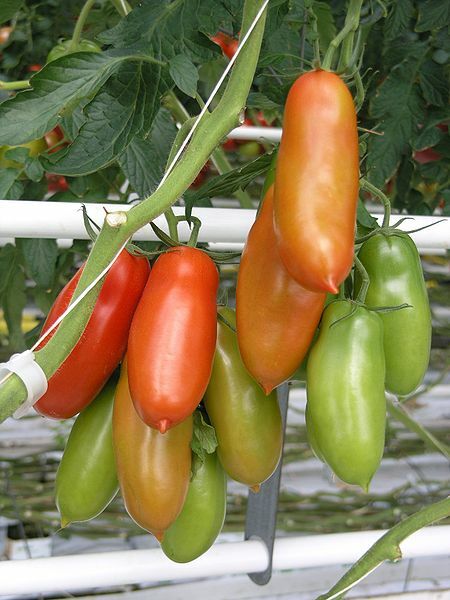 San Marzano Italian plum tomatoes are the best to use, and are considered by many chefs to be the best sauce tomatoes in the world. Second best, fresh plum tomatoes, or another kind of canned plum tomatoes. The flavour of this dish relies so heavily on the taste of the tomatoes that the small increase in cost is well justified. This is a relatively quick dish to put together, coming in at about 40 minutes. And most of the time is sitting on the stove and stewing, so you can do other things. That makes this dish a perfect weeknight dinner. Serve it with a side of rice (and a vegetable if you desire) and you’ll have a wonderful dinner in no time flat. Heat a wide sauté pan over high heat. Do not add any oil. Add the chicken thighs, skin side up, into the hot pan. Season with some salt and pepper. Let cook until the meat releases naturally from the pan, about 5 minutes. Turn and repeat on the other side. Remove the chicken to a plate. It will not be cooked through. Remove all the rendered chicken fat except for about 1 tablespoon. Add the onion, garlic and celery. Sauté until the onions soften and begin to brown, a further 5 minutes. Add the vermouth to the pan to deglaze. Scrape the brown bits off the bottom of the pan. Add the tomatoes, basil and oregano and bring to a simmer. Nestle the chicken into the liquid and partially cover. Let cook for about 20 minutes, until the sauce has reduced and thickened. Stir occasionally to prevent burning. Serve with hot cooked rice. Sprinkle the top of the chicken with chopped olives.